Hyderabad is just as famous for its palaces and forts, as it is for its biryanis and haleems. There are lots of amazing places to see in Hyderabad. Once one of the grandest cities in the world, Hyderabad flourished under the various Nizams who ruled it from the 18th to mid-20th centuries. 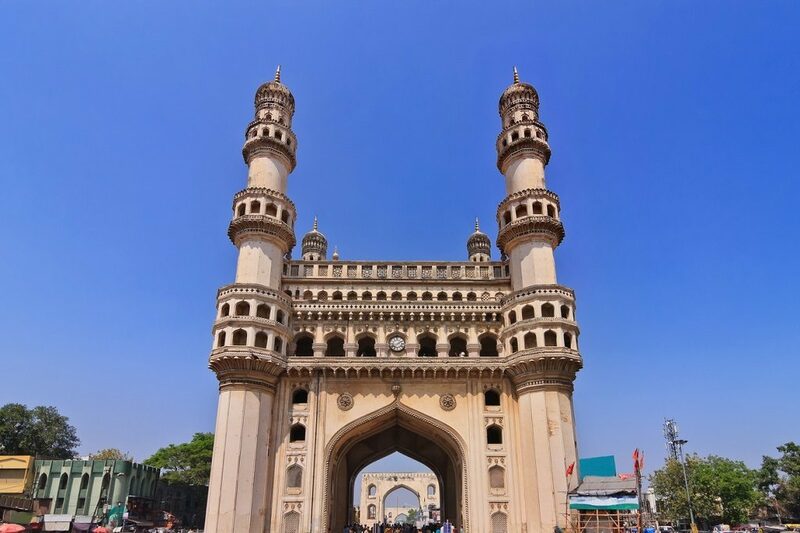 One of the most iconic symbols of Hyderabad is the Charminar. Constructed in the 16th century, there is a lot of mystery as to why it was built. You can also get magnificent views of the city from the top and visit the various markets below. 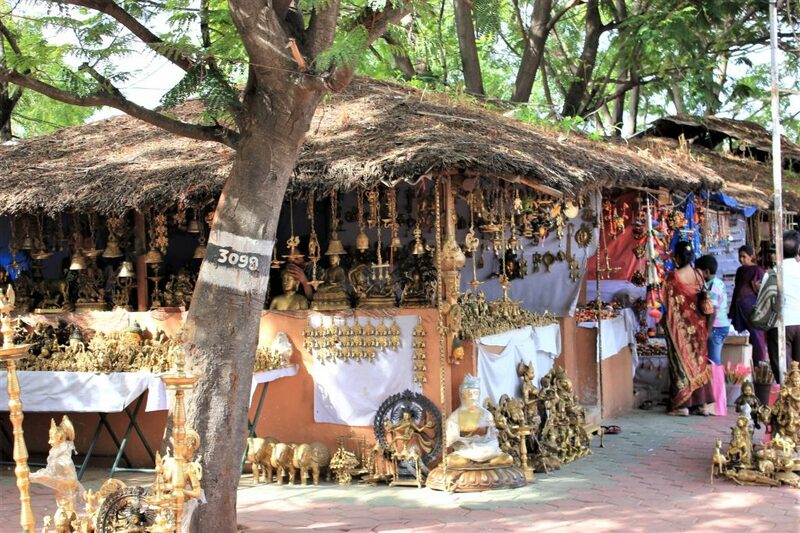 Make sure to check out the jewellery and the handicrafts, especially the bidri metalware. 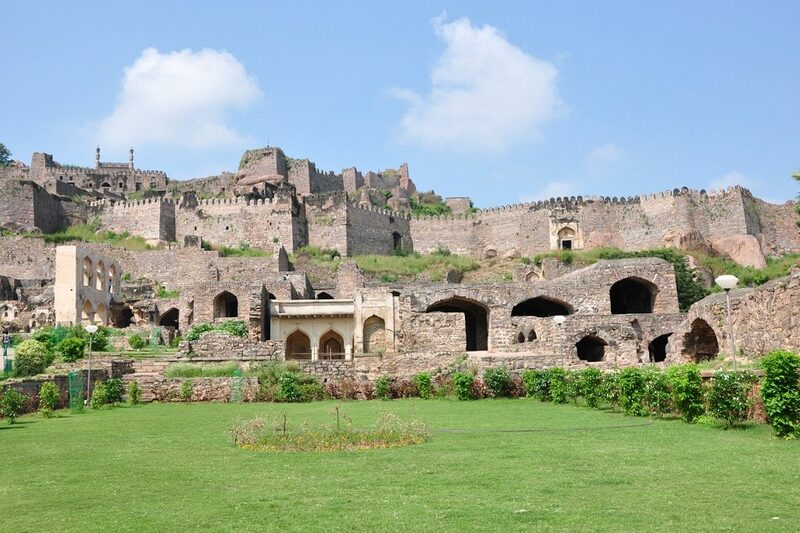 Once the capital of the medieval sultanate of the Qutb Shahi dynasty, the magnificent Golconda Fort is an archaeological gem. It is built on a tall granite hill, the fort dates back to the 12th century. The fort is also famous for the fact that a sound made from below the entrance dome can be heard at a pavilion nearly a kilometre away. 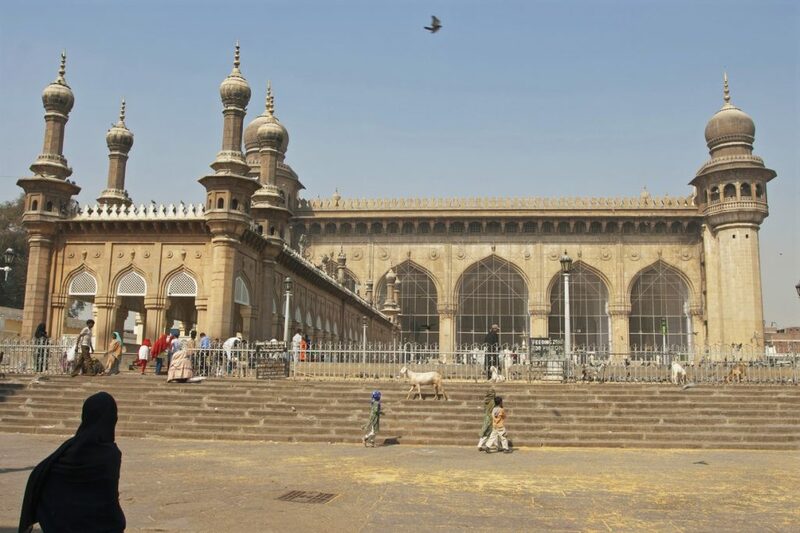 Mecca Masjid is one of the largest mosques in the world. It was built over 77 years, using soil from the holy city of Mecca and competed in 1694. The mosque features beautiful inscriptions from the Quran, as well as a preserved strand of the Prophet Mohammed’s hair. Its hall can hold up to 10,000 people. Built on 40 acres, this 18th-century palace is known for its exquisite antique furniture, Belgian-crystal chandeliers, and many royal artefacts including a 1911 yellow Rolls Royce. It was once the official residence of the Nizams of the Asaf Jahi dynasty and hosted many grand celebrations. 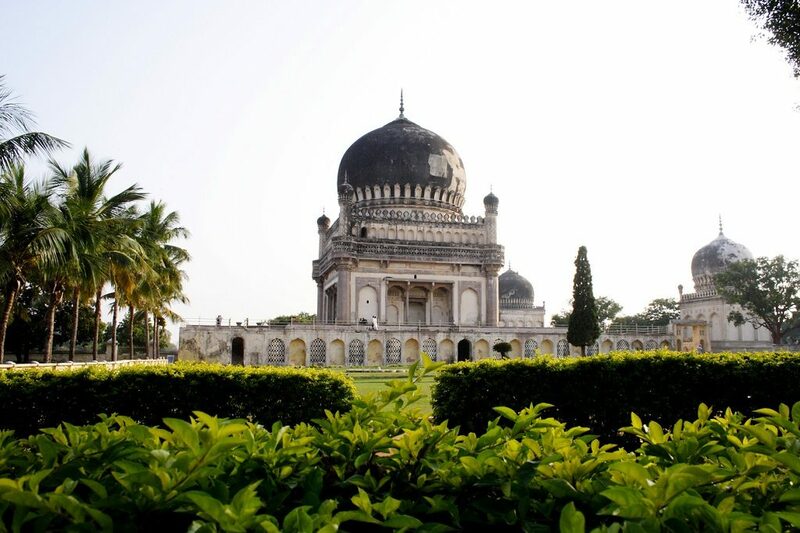 Located near Golconda Fort, the Qutub Shahi tombs are the resting places of the seven rulers of the Qutub Shahi Dynasty. The 21 tombs are also occupied by various physicians, courtesans, and other privileged courtiers. Each of the domes tombs is ornamented with lime stucco decorations. 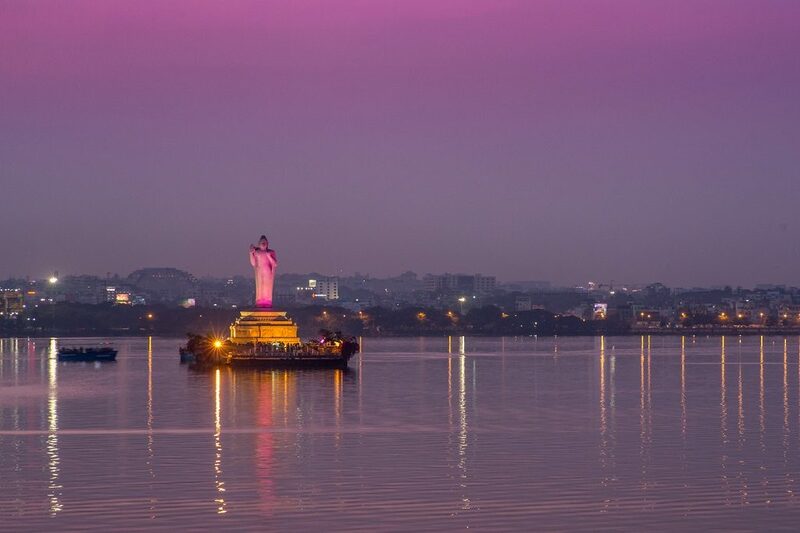 The Hussain Sagar Lake is said to be one of the largest man-made lakes in the city. It was built by Ibrahim Quli Qutb Shah in 1562 and is fed by the River Musi. At the centre lies a massive 59-foot tall monolithic statue of the Gautama Buddha, erected in 1992. There is also a lot to do around the lake, such as boating, parasailing, and many restaurants and stalls. 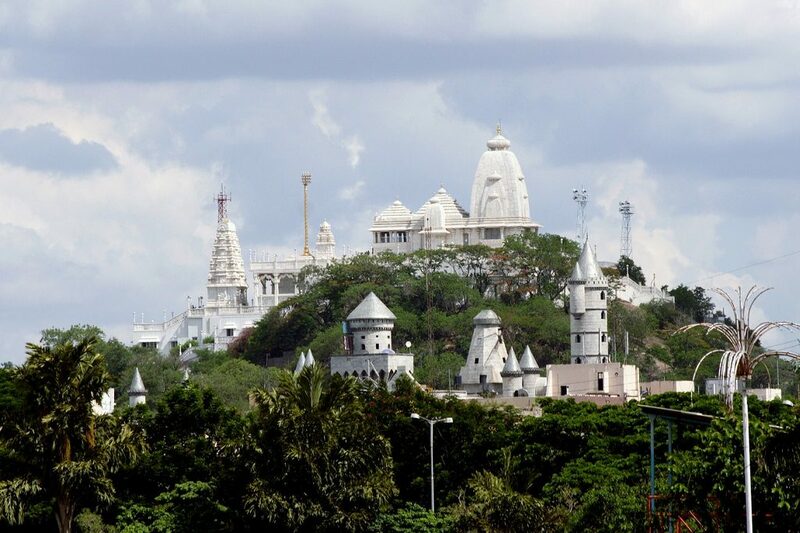 Built on a hillock called Naubat Pahad, the imposing Birla Mandir is spread across 13 acres. The temple was opened in 1976, and was Swami Ranganathananda of Ramakrishna Mission. It is built entirely of white marble and has towers, shrines and interior carvings. 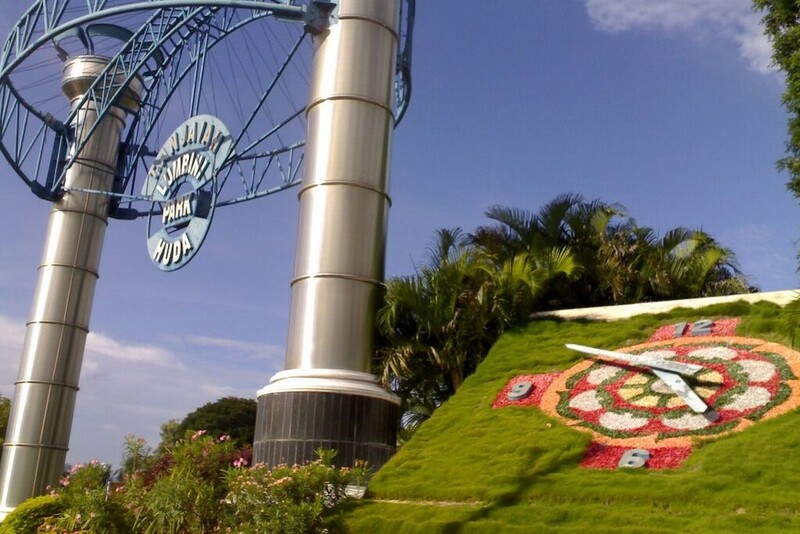 The popular Lumbini Park is a refreshing retreat from the hustle and bustle of Hyderabad. Located in the centre of the city near Hussain Sagar, it is known for its gardens, lake, and its musical fountain shows. The park also features a large Buddha statue and is named after Lumbini of Nepal. 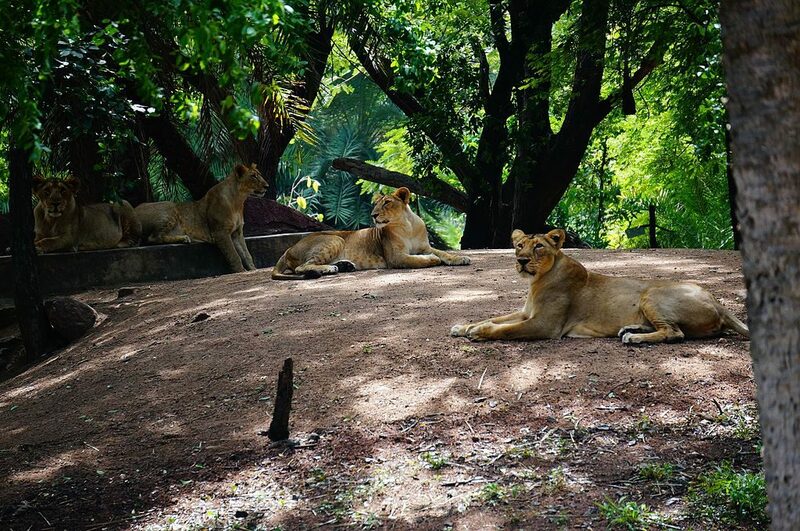 The spacious 380-acre zoo Nehru Zoological Park (also known as the Hyderabad Zoo) is one of the most popular destinations in Hyderabad. It is home to over 1,500 odd animals across various species, including tigers, lions, rhinos, elephants, pythons, giraffes, leopards and more. The zoo also runs multiple safari trips each day. 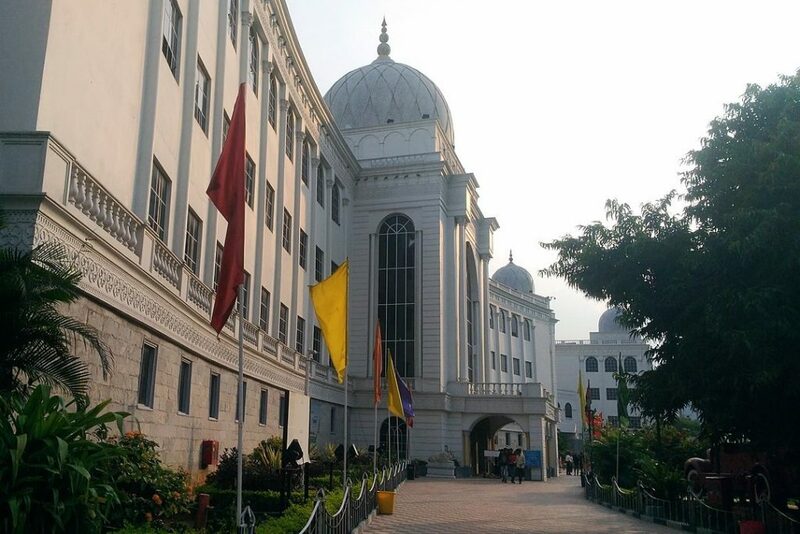 The B. M. Birla Science Museum in Hyderabad is a renowned institution, with various innovative programmes. 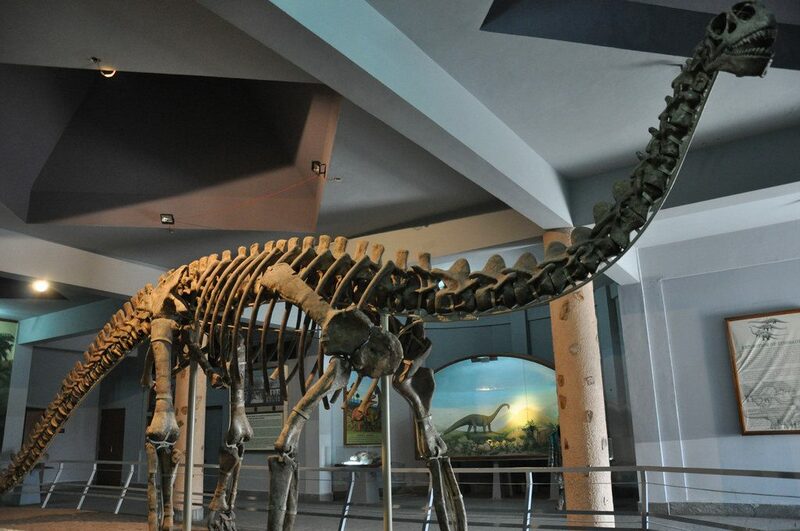 Inside the museum, there is a planetarium (one of three Birla Planetariums in India), and a dinosaurium, which exhibits various species, including the 160-million-year-old mounted Kotasaurus yamanpalliensis excavated in the state of Telangana. Shilparamam is a quaint little ‘artificial village’ which showcases various traditional arts, handicrafts and cultural performances. Spread across 65 acres, it also has a lake and a museum. The village is meant to be a space to preserve traditional food and crafts, so be sure to try some of the delicious food at the restrains and stalls. Once the home of royalty, the 19th-century European-style Purani Haveli was the official residence of the Nizam. 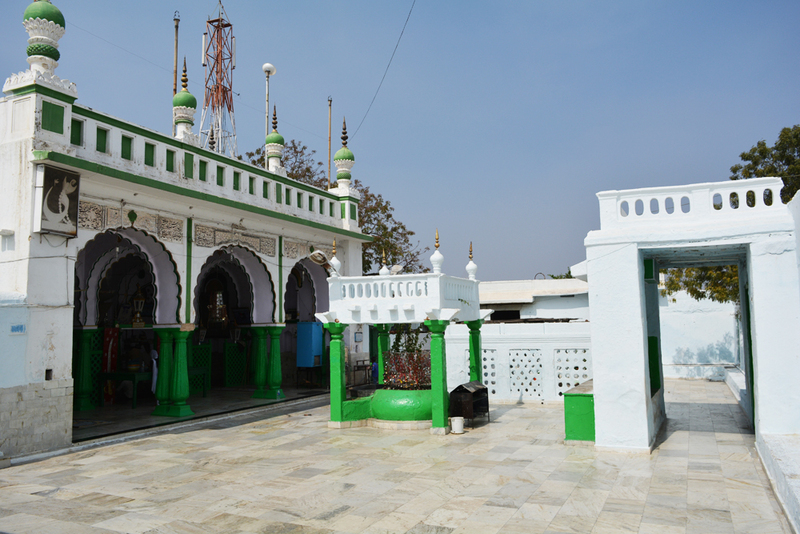 It was originally constructed for Sikander Jah, Asaf Jah III by his father Ali Khan Bahadur, Asaf Jah II. 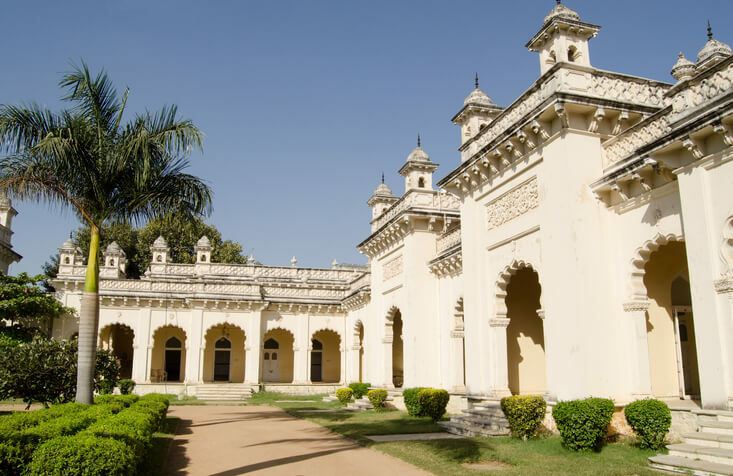 The palace also houses the Nizam’s museum, which has artefacts from the city’s history and is dedicated to the last Nizam of Hyderabad state. Laad Bazaar (or Choodi Bazaar as it is also called) is an old market known for its bangles (laad means ‘lacquer’ which is used to make bangles). 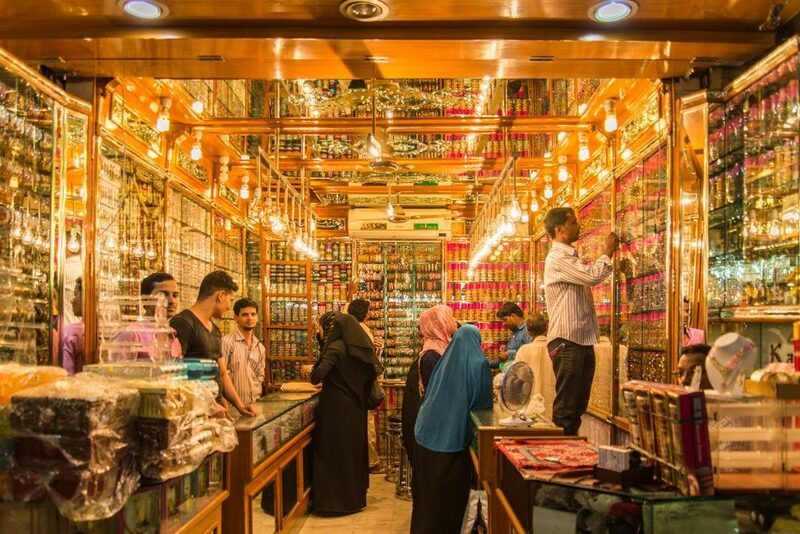 Located near Chowmahalla Palace and the Charminar, this shopping area is full of shops selling bangles, semi-precious stones, silverware, perfumes, pearls, jewellery, saris, and other wedding related items. 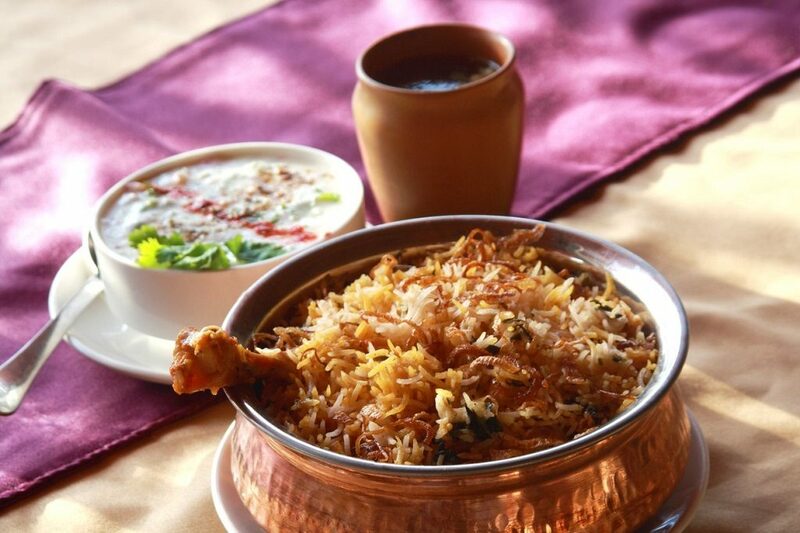 Hyderabad is also known to have some of the best biryani in the world. Made with long-grained, fragrant basmati rice and marinated meats cooked with spices, biryani was once considered the dish of Nizams. It is now popular across the country. 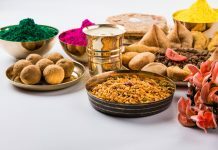 There are many iconic places to enjoy this dish in Hyderabad, including Bawarchi, Paradise Restaurant, Meridian Café, Ulavacharu, Nizam Club, and more. Popularly called the ‘Visa’ Balaji Temple, the Chilkur Balaji Temple is famous for drawing people who are praying for visas abroad. 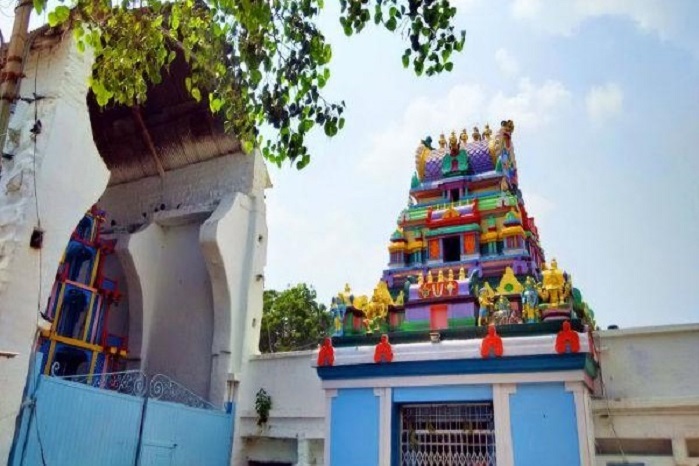 Located on the banks of Osman Sagar Lake, 30 kilometres from Hyderabad, it is also one of the oldest temples in Hyderabad. 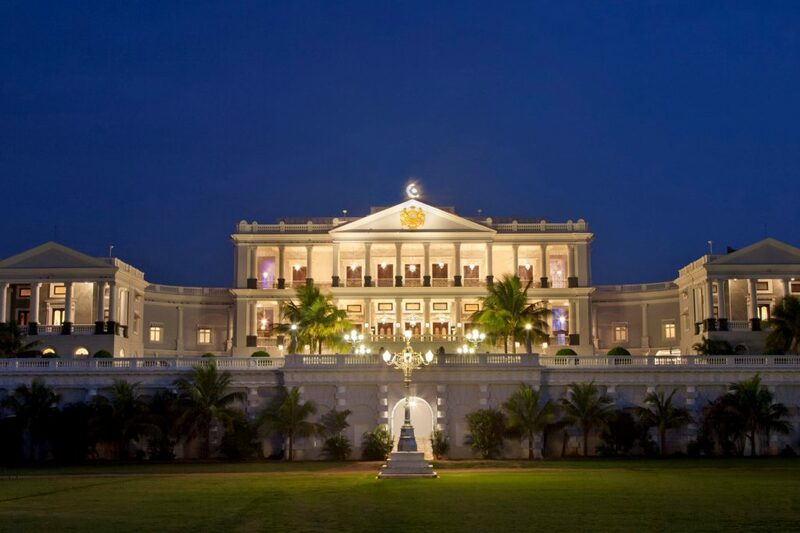 The Falaknuma Palace (or the Taj Falaknuma Palace as it is now known) is a large palace near Charminar. It was built by Sir Viqar-ul-Umra, and later belonged to the Paigah family and the Nizams. Covering 32 acres, the palace and its grounds are full of amazing art and architecture. Now a hotel and is open to the public. 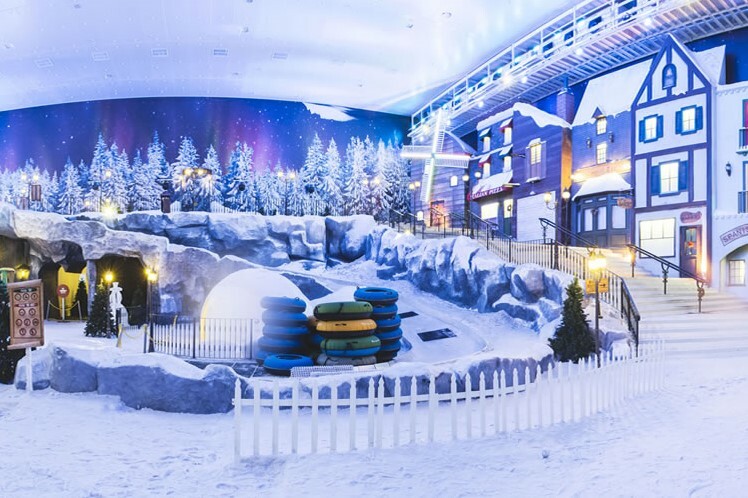 This popular attraction in Hyderabad is family-friendly indoor park filled with artificial snow, as well as winter themed games, an ice skating rink, and play areas. It was opened in 2004 and is located near the Hussain Sagar Lake. The amusement park gives visitors protective clothing and hot drinks to acclimatise them to the low temperatures. Also near Hussain Sagar Lake is Necklace Road. 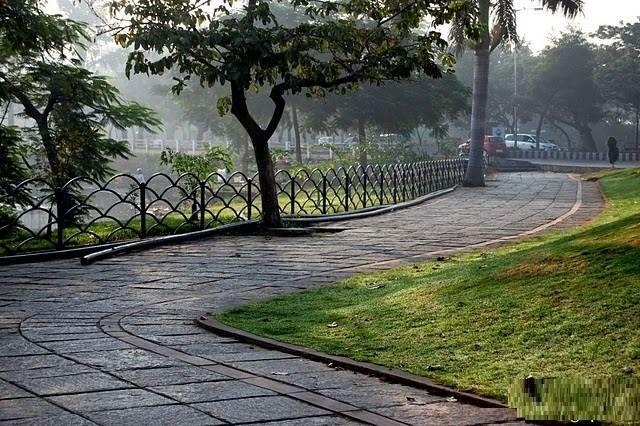 Named after the famous Necklace Road in Mumbai’s Marine Drive, it connects to many nearby parks, such as NTR Gardens and Sanjeevaiah Park. The road is also lined with lots of restaurants and cafés, as well as recreational facilities which have regular exhibitions and shows. This museum looks at the numerous different cultures and heritage of the many tribal peoples of Andhra Pradesh and Telangana. Here you can learn all about their lifestyles, traditions and customs. 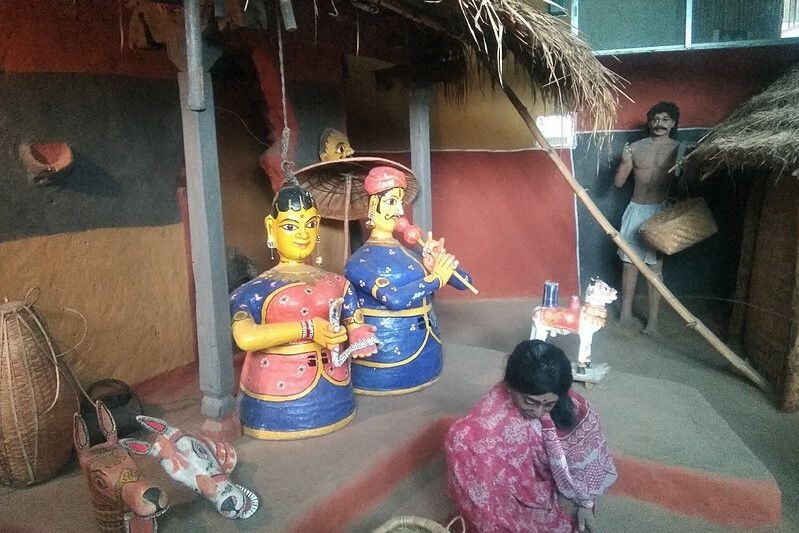 There are also exhibits of tribal tools, crafts and other artefacts, as well as dioramas of village life and an audio-visual room. This stunning neo-classical mansion was built in the early 1800s by James Achilles Kirkpatrick, the East India Company representative. Its zenana (or women’s quarters) features a miniature model of the building, and a massive ballroom complete with large chandeliers. 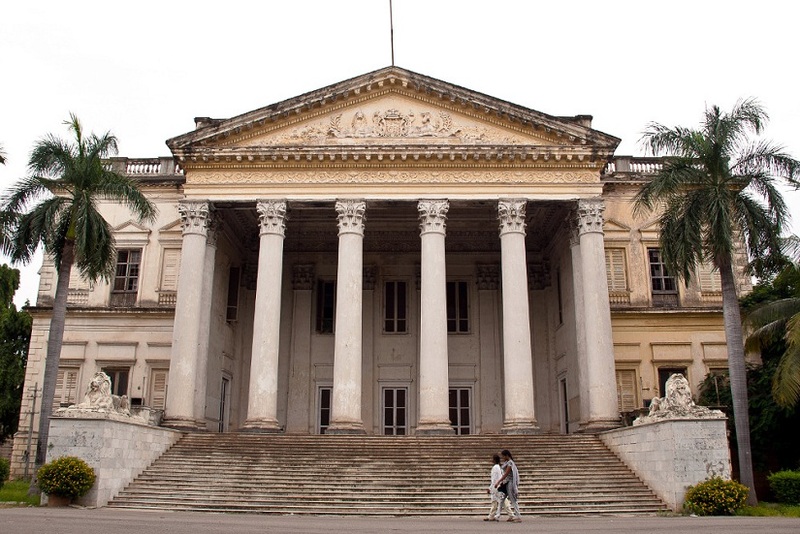 Though the building is now part of the Osmania University College for Women and is in disrepair, it’s still worth a visit. Top the Maula Ali hill, sits a shrine dedicated to Maula Ali, the cousin and son-in-law of the Prophet Mohammad. It was built by Sultan Ibrahim Qutub Shah, and features an interior decorated with thousands of mirrors. Also on the hills is a holy stone that is said to have healing powers. The Hyderabad Botanical Garden, or the Sri Kotla Vijayabhaskara Reddy Botanical Garden, was developed by the Telangana Forest Department. It aims to be a centre of conservation as well as a place that will educate the people. 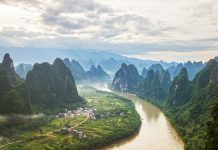 The gardens are divided into five sections, which include medicinal plants, timber trees, fruit trees, ornamental plants, aquatic plants, bamboo and more. 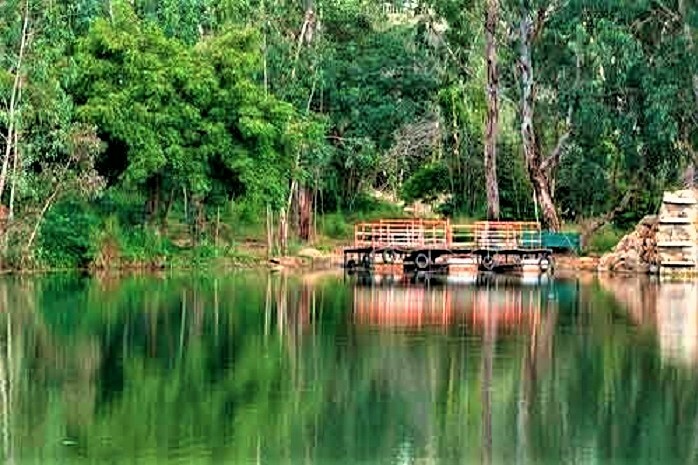 There are also many pleasant walking paths, rock formation and lakes to explore. 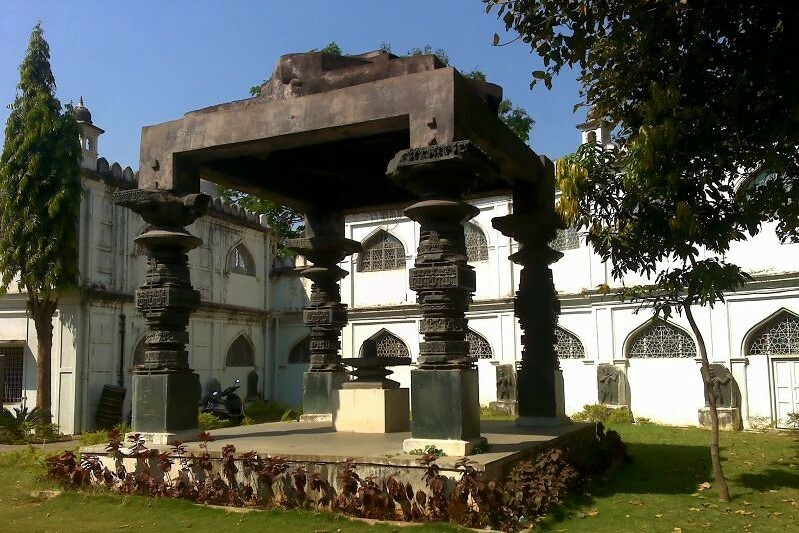 Also known as the Hyderabad Museum, this is the oldest museum in the city. It features many collections of Buddhist artefacts, including bronze statues, stupas and many paintings from Ajanta. 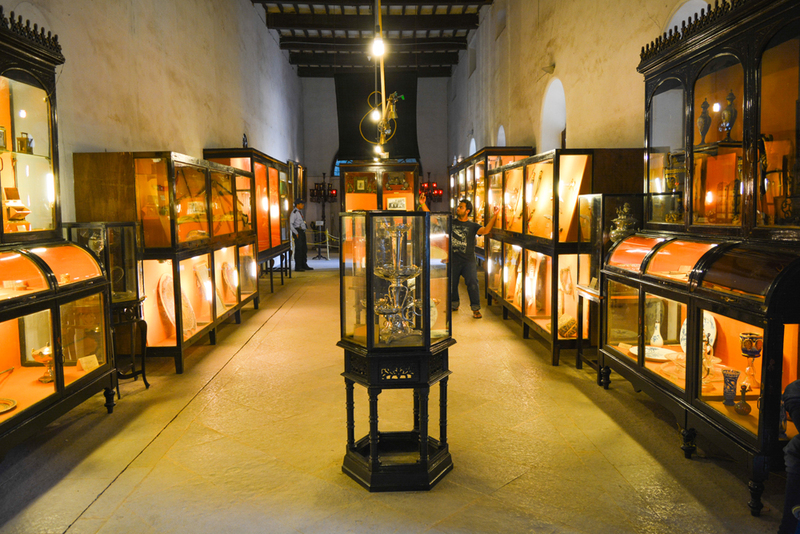 There are also artefacts belonging to various Nizams, as well as an Egyptian mummy. While these are the top places to see in Hyderabad, you might also want to check out these 11 offbeat things to do in the city. Of course, there are lots of places to see in Hyderabad, and if we’ve missed any, be sure to share them in the comments below.